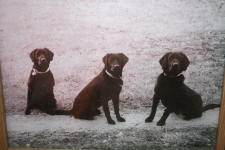 Here at A&K Kennels our training helps you and your dog to have a better relationship .It starts with evaluating where your dog is with you and your lifestyle and discuss what you need from the training, Not all dogs are the same so we look at how your dog will respond to a training course and then show you what to expect. Here is Rudy one of my lab pups when around 9 months old sitting and as i move away he still sits totally off lead. At the top of our site you see the three labs sitting . dolly, fish, magnum. the picture was taken over 20 years ago. Now Rudy is following in their footsteps with Gus, Clare, Maddie and Deets not far behind. Gus our yellow male and Rudy sitting together at bottom left picture. Maddie the choc female , Clare the yellow female, and Deets the black male on the top left all sitting while i take their photo. 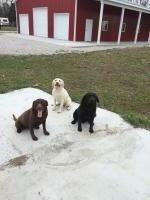 All three of these dogs are part of our family and are very young and they are learning fast! Once fully trained your dog can go be with you anywhere you can take him and have confidence in yourself to handle him to come to you when called and or sit or lie down where you need for him too if you are where you can have him off leash. If you choose a training program for your new pup we will be here for you to train you to train your pup at home no matter where you live. With the ability to contact us at anytime to go through vital steps to help you with issues. A new pup can be a great addition to a family but at the same time can be a handful. So give us a call to discuss what to expect from your pup and their training.